Stress is, of course, unavoidable, and the point of stress reduction and stress management programs is not to eliminate it entirely. Meditation is a technique that, if practiced for as few as 10 minutes each day, can help you control stress, decrease anxiety, improve cardiovascular health, and achieve a greater capacity for relaxation. A patient recently asked me if meditation for stress relief might also improve her asthma. There is no doubt that asthma can be stressful, or that having a child with asthma adds stress on top of an already difficult job. Turns out that meditation may help you get control of your asthma in addition to helping out with the day to day life. Is There Science Behind Meditating and Asthma? Stress is a potent trigger for inflammation, part of the pathophysiology of asthma, in patients with chronic illness. Not surprisingly, patients with diseases that result from inflammation will often look for methods to reduce stress as a possible treatment or adjunct. In fact, as much as 40 percent of the diagnoses leading people to try complimentary and alternative medicine practices (CAM) are conditions that lead to inflammation, including asthma. Mindfulness techniques to promote openness and acceptance have been advocated as a way to decrease stress and resulting inflammation. Given the relationship between inflammation and asthma control, the benefits of a meditation program are obvious if the techniques are effective. In one study comparing an 8-week Mindfulness Based Stress Reduction (MBSR) intervention to a control group, the MBSR group experienced less inflammation after stress. This suggests that interventions targeting emotional reaction may be effective in reducing inflammation and, potentially, outcomes in chronic inflammatory conditions. This study also references a growing body of literature pointing out that interventions designed to decrease emotional reactivity are beneficial for patients with chronic inflammatory conditions, and that these techniques may be more effective at relieving inflammatory symptoms than other activities that promote well-being. There are very few potential side effects of meditation, especially when compared to the benefits. The practice may also reduce cost because patients can practice in their own homes any time they need to. 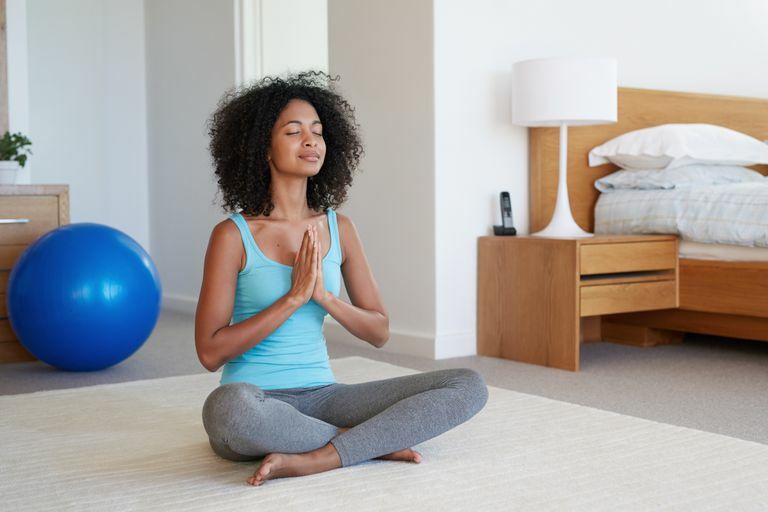 Want to try meditation for better asthma control? Consider these options. 1. Concentration meditation: A concentrative meditation technique involves focusing on a single point. This could be watching the breath, repeating a single word or mantra, staring at a flame, or listening to a repetitive noise. Since focusing the mind is challenging, a beginner might meditate for only a few minutes and then work up to longer durations. In this form of meditation you just refocus your awareness on the chosen center of attention each time you notice your mind starts wandering. Instead of pursuing random thoughts, let them go. Through this process your ability to concentrate improves. 2. Mindfulness meditation: Mindfulness meditation techniques encourages you to observe wandering thoughts as they drift through the mind. The intention is not to get involved with the thoughts or to judge them, but to be aware of each mental note as it arises. Through mindfulness meditation you can see how your ideas and feelings tend to move in certain patterns. Over time, you can become more aware of the human tendency to quickly judge experience as “good” or “bad.” With lots of practice, you develop an inner balance. Some practice a combination of concentration and mindfulness. Many disciplines call for stillness — to a greater or lesser degree, depending on the teacher. These tips are meant to help you get started and hopefully continue your practice in meditation. Sit for a few minutes. This will seem incredibly easy, to just meditate for a few minutes. Start with a few minutes a day for a week and if that goes well, increase your time a little more for another week. Continue this process until you feel you are comfortable to do it more and more. The key is to do it first thing each morning. Set a reminder every morning when you get up because it is easy to forget about something that will only take a few minutes. Don’t get caught up in the how—just do. Most people worry about where to sit, how to sit, what cushion to use and any other aspect you think are important. This is all nice, but it’s not that important to get started. Start just by sitting on a chair, couch, or bed. If you’re comfortable on the ground, sit cross-legged. It’s just for a few minutes at first, so just sit and relax. It is important that you are comfortable. Count your breaths. Now that you’re settled in turn your attention to your breath. Just place the focus on your breath as it comes in, and releases out of your nose. Try counting “one” as you take in a breath, then “two” as you breathe out. Continue counting until you reach 10 and then repeat the process. If you find your mind wandering, start back at one. It is normal for your mind to wander. There’s no problem with a wandering mind. When you notice your mind wandering, smile, and simply gently return to your breath. At first, you might feel a little frustration, but it’s perfectly alright not to stay focused, we all do it. This is the practice, and you won’t be good at it for a little while. Develop a loving attitude. When you notice thoughts and feelings arising during meditation, as they will, look at them with a friendly attitude. See them as friends, not intruders or enemies. They are a part of you, though not all of you. Be pleasant and not harsh. Don’t get fixated too much that you’re doing it wrong. It is a process that you have to get used to getting it down. It's important to remember that it's not considered wrong. Don’t worry about clearing the mind because a lot of people think meditation is mainly about clearing your mind, or having no thoughts, but that isn't true. That is not the goal of meditation. If you have thoughts, that’s normal. Our brains are meant to think constantly, and we can’t just shut them down at any time. What you should try to do is practice focusing your attention on one particular thing, and practice even more when your mind wanders. When thoughts or feelings arise, they will most likely stay with you. We tend to want to avoid feelings of frustration, anger, or anxiety. An amazingly useful meditation practice is to remain with the feeling for awhile. Just stay, and be curious. Get to know yourself. This practice isn’t just about focusing your attention; it’s about learning how your mind works. What’s going on inside there? It’s murky, but by watching your mind wander, get frustrated, and avoid painful feelings, you can start to understand yourself as a person. Make friends with yourself and as you get to know yourself, use a friendly attitude instead of a judgmental one. Do a body scan. Another thing you can do, once you become better at following your breath, is focus your attention on one body part. Start at the bottom, with your feet and think about how they feel and work your way up to your head. Notice the light, sounds, energy. Another place to put your attention on after you’ve practiced with your breath for some time is the light around you. Keep your eyes on one particular spot, and notice the light in the room you’re in. Another day, just focus on noticing sounds. Another day, try to see the energy in the room all around you. Repeat a word or phrase. Focusing on the present is one mindfulness mantra that helps anchor you. Thinking about the past often lead to depressed feelings when we think about how things did not go as planned or we worry about the future, while focusing on the present is generally good. One technique for this is object focused meditation. By observing details of the object and things like how light falls on the object, how sharp the edges are, and the texture of the object you are able to quiet the mind and experience inner peace and tranquility. When you notice the mind straying you just refocus on the object. Remembering your potential is another useful mantra. We are neither the best or worst experiences of our lives, we are capable of change in the moment and what we do next is entirely up to us. One final mantra is remembering that nothing is permanent. Nothing we experience- either good or bad- is permanent. Remembering this allows us to avoid getting attached to any particular outcome or situation. Guided imagery. A guided imagery technique can be inserted after after counting or monitoring your breathing for a period of time. The purpose is to provide you with a scene that distracts you from any negative thoughts and completely absorbs your attention. As you go deeper into the scene your stress decreases and relaxation increases with resultant physical changes. One example might be thinking specific thoughts about your own body image. After you have monitored your breathing for a period of time you might begin to focus more specifically on your body and think about the part of your body you dislike most and focus on that area of your body. What are you thinking? How do you feel? How do these thoughts make you feel? Be aware of damaging these thoughts can be to your emotions. Follow this with several mantra like thoughts such as: I accept my body as it is with all its imperfections; My body does not define me or take away from who I am as a person; I accept my body and there is not need to be perfect; I am free of judgment and will not say negative things to myself; I accept myself. In relation to asthma you might imagine yourself free breathing and incorporate this into your daydreams. You might also get more specific and imagine a better, healthier you in much the same way as the self image example. Finally, you could get very specific and imagine specific cells that are part of the pathophysiology of asthma relieving inflammation or not reacting in response to a trigger. Marie Kim Wium-Andersen, MD; David Dynnes Ørsted, MD; Sune Fallgaard Nielsen, MScEE, PhD; Børge Grønne Nordestgaard, MD, DMSc. Elevated C-Reactive Protein Levels, Psychological Distress, and Depression in 73 131 Individuals. JAMA Psychiatry. 2013;70(2):176-184. doi:10.1001/2013.jamapsychiatry.102. Can You Achieve Asthma Homeostasis? Can a Food Improve My Asthma?